The bid for the inclusion of additional sports for the 2024 Olympic Games in Paris is in full swing. The French Organising Committee needs to hand a shortlist containing its recommendation of sports to be included to the IOC in March. This list will be looked into, discussed and might even be amended. The final decision won’t be made before the end of 2020, after the Tokyo Olympics. After several unsuccessful bids to be included as part of the Olympic programme, squash is regularly mentioned amongst the strongest contestants. The sport has learned the lessons from its previous failures and has progressed. Now, all the arguments are set. Jacques Fontaine, President of the World Squash Federation (WSF), explains all about the Olympic bid during an interview with FrancsJeux. FrancsJeux: Squash has launched its bid to be chosen as an additional sport for the 2024 Olympic Games in Paris very early. We are now only a few weeks away from the first shortlist. Can you give us an update? ‘’Its goal was to unify the squash community around the same Olympic ambition and, therefore, to guarantee the attendance of the world’s best players at the Olympic Games, if we are chosen. ‘’They expressed their ambition to gather a medal, especially the gold medal. FJ: Squash started its inclusion in the Olympic community by being a demonstration sport at the Youth Olympic Games in Buenos Aires in October 2018. How was this perceived? ‘’We were actually a bit surprised. Over 25,000 people came by the squash venue. ‘’The system enables the best players to train and helps people to discover the sport with a similar approach to the one offered by video games. ”With this concept, we matched one of the IOC expectations: offer a special activity, a novelty, and appeal to a non-specialised public. FJ: It is not squash’s first bid. How does the current one different compared to the previous ones? ‘’For the first time, all the squash community is united around the same Olympic ambition. ‘’In addition, the innovation brought by the interactive wall is giving to the bid a more modern approach. 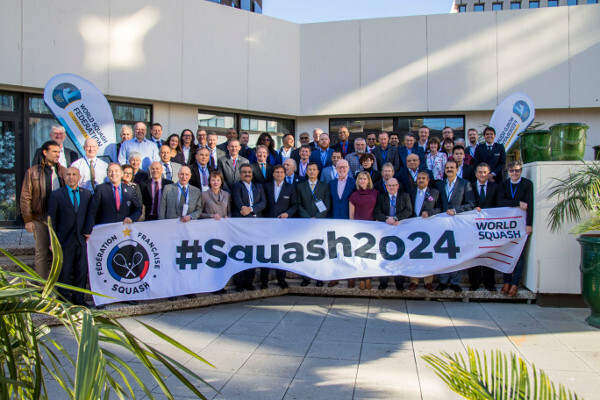 FJ: What would the squash competition look like at the Paris 2024 Olympic Games? ‘’It would gather all the world’s best players, likely including some of the current best youth French players, in a spectacular and dynamic atmosphere. FJ: Since the application phase, the Paris 2024 Organising Committee insists on incorporating sustainable sports, with controlled budgets and a limited impact on society. Do these three requirements apply to squash? JF says: ‘’Definitely. Concerning the costs, things are very clear: the competition will be played on a single glass court, which only requires a 70m² surface on the ground, and 25 hours to set up and 15 hours to dismantle. ‘’If you include 5000 seat stands, the complete squash venue could fit inside a 5-6000m² area. ‘’The list is consequential. This layout completely matches with the costs and sustainable stakes. ‘’For such an urban sport as squash, there would definitely be a before and an after to Paris 2024.